The Kwara State chapter of the Peoples Democratic Party (PDP) has appealed to journalists in the State not to boycott coverage of political activities in the State. The State Council of the Nigerian Union of Journalists, NUJ, had last week threatened to withdraw coverage of political parties in the state if attacks and assaults on its members by supporters of political parties and suspected thugs continue unabated. Some members of the union were allegedly attacked in some parts of Ilorin during the recently conducted governorship primaries of the All Progressives Congress (APC) in the State. 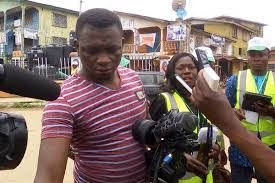 Another correspondent of Daily Trust was reportedly assaulted at a rally organised by the supporters of one of the governorship aspirants of the APC. In a statement on Wednesday by its State Publicity Secretary, Mr Tunde Ashaolu, the Kwara PDP condemned the attack on the newsmen, describing it as barbaric and unacceptable. "We condemn in strong terms the barbaric, worrisome and an unacceptable attack on journalists and the destruction of their equipment by thugs and supporters of some politicians in the State. "The party empathises with the affected journalists and appeal to them and their professional colleagues not to stop reportage of political events vis-a-vis activities of political parties in the State. "We advise the NUJ as a body to formally report the incident to security agencies in the State. We equally call on the police to thoroughly investigate the attack, arrest the culprits and their sponsors and bring them to justice. "As a party, we value the work and contributions of members of the fourth estate of the realm and we regard them as partners in progress. "We, therefore, call on politicians in the opposition to warn their thugs and supporters to stop their ceaseless attacks on journalists who move around to discharge their constitutional duties."